Connection is a basic human need. Neurobiological research shows that life without connection has devastating emotional and physiological consequences. The act of connecting, however, can be complex. Making a connection with someone asks us to be vulnerable, to be truly present, to listen, to open and create and hold space for one another. We believe in the power of collective impact, in our potential to do so much more together than we could ever do alone. But to cultivate connection and develop greater requires practice. If we build this capacity within ourselves, we simultaneously grow the readiness of our institutions and communities to tackle the complex social and environmental issues of our times. Our community consciousness work designs, curates, and invites opportunities for connection. We believe that the simple acts of sharing space, a meal, or a peak experience are the building blocks of resilience, constructive dialog, and lasting social change. Check out Supper Club and stay tuned for more opportunities to build connection, coming soon. Day-to-day life is FULL. Sometimes that fullness is exhausting, while at other it is joyful and inspiring. Regardless, the tactical demands for keeping one’s life on the rails are real and leave little time to sit with, think about, and discuss big questions. The ones that keep you awake in the still 3 AM darkness. The ones that find opportunity to settle in during a long, quiet drive. Yet these too-often squeezed-in or brushed-aside questions are paramount to our times. They shape our intimate relationships, our social infrastructure, our political landscape, the very environment that surrounds us. They shape us. 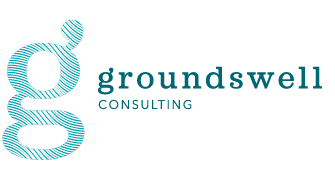 This, more than anything else, is the motivation behind Groundswell Consulting's Supper Club. Once each season, a group of twelve is invited to a facilitated dinner party focused on a celebration of local foods and an in-depth conversation based on a single big question. At the close of each evening, guests are encourage to submit big questions for future gatherings to keep the cycle of generative conversation alive and rich.